The purchase of The Three Tuns, an historic, grade II listed, 17th century pub in Guilden Morden, Cambridgeshire, has been completed following a five-year battle to save the former village watering hole. Over £250,000 in share capital has been raised by the community to buy and renovate the pub. In total, 267 private investors have bought shares, including several held in trust for children and grandchildren. In addition, the community was awarded £100,000 in grants and loans under the More Than A Pub programme which was set up in 2016 to support community ownership of pubs in England. This programme is funded by the Ministry of Housing, Communities and Local Government and Power to Change, and is delivered by the Plunkett Foundation. Co-operative & Community Finance arranges loan finance for groups that have successfully attracted local investment, usually in the form of community shares. 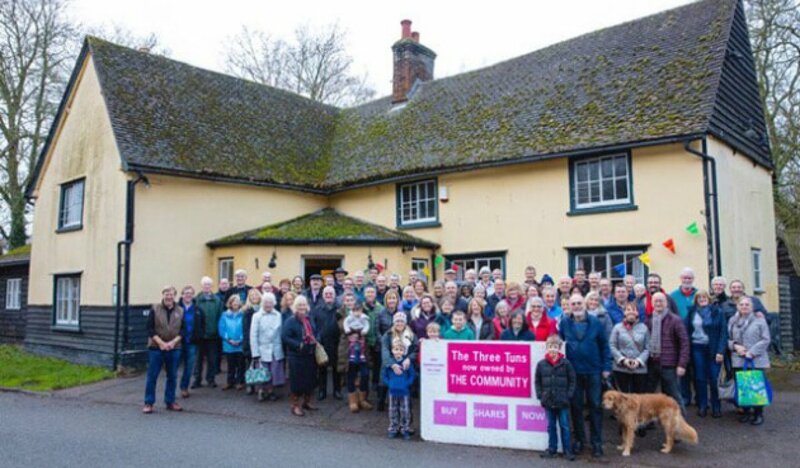 John Harrison, a member of the Guilden Morden Community Pub Management Committee, said: “It has been a long and arduous journey to save The Three Tuns but we are delighted to have this important village asset one step closer to being open as a community pub. “The pub has been neglected for many years and our focus now is to renovate the building, decorate and sympathetically modernise throughout, and tidy up the overgrown garden. Although ambitious, we are hoping to be in a position to open the pub again next Easter and serve our first pint of beer! Many people from Guilden Morden and the surrounding villages have offered to help clear the pub and there has also been support from professionals to provide some pro bono help. The community benefit society will shortly be looking to recruit a community-minded tenant to run The Three Tuns. A newly renovated two-bedroom flat will be available. With no brewery or agent ties, any potential tenant, with the support of the Management Committee, will have a free rein to shape the future of this community owned pub.